British scientists have grown part of a human heart from stem cells for the first time. His researchers at Harefield hospital managed to grow tissue that works in the same way as human heart valves. The team which spent 10 years working on the project included physicists, pharmacologists, clinicians and cellular scientists. Researchers will see their achievement as a major step towards growing entire organs for transplant. 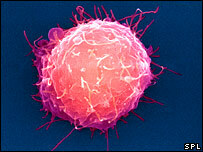 Stem cells have the potential to turn into many different types of cell. Many scientists believe it should be possible to harness the cells' ability to grow into different tissues to repair damage and treat disease. Previously, scientists have grown tendons, cartilages and bladders, which are all less complex. Sir Magdi, professor of cardiac surgery at Imperial College London, had been working on ways to address a shortage of donated hearts for patients. He said he hoped that soon an entire heart could be grown from stem cells. He added: "It is an ambitious project but not impossible. If you want me to guess I'd say 10 years." His team extracted stem cells from bone marrow and cultivated them into heart valve cells. After they were placed in scaffolds formed from collagen, 3cm-wide discs of heart valve tissue were formed. Later in the year, these will be implanted into animals such as sheep or pigs to see how well they fare. Heart valves do not simply open and close like the artificial alternatives currently used in surgery, they are able to anticipate changes in the way the blood flows, and respond accordingly. Professor Yacoub's team hope the valves they are growing will be equally sophisticated. In theory, if the valve was grown from the patient's own cells there would also be no need to take drugs to stop the body rejecting it. They would also be potentially much longer lasting than artificial valves, which often have to be replaced after several years. Dr Adrian Chester, a senior member of the research team, said: "We are attempting to grow a valve that will be functional in adults and children and will be made entirely of living tissue. "Hopefully it will be able to adapt to its environment, and then just sit there and function just as a normal valve functions under normal physiological conditions." Dr Chester said ultimately the work could mean that some patients might be able to avoid a heart transplant. Dr Stephen Minger, a stem cell expert at London's King's College, said Sir Magdi's team were at the forefront of tissue engineering for cardiac disease. "If the valves they've engineered prove successful in experimental animals, this could open the door to generating complex tissues from stem cells for a wide variety of clinical application. "But as they stress, this is very preliminary work and the direct translation to human is still some way off in the future." Professor John Martin of the British Heart Foundation, which supported the research, said: "This opens the possibility that whole parts of the heart may be made in the laboratory from the patient's own stem cells. " He said patients could benefits because using the tissue could prevent the need for a heart transplant. Professor Martin added: "Although the work carried out the Harefield is exciting there is a long road to be travelled before patients awaiting heart transplants will benefit from this research." Heart disease is the UK's biggest killer. More than 200,000 people died from heart disease and strokes in 2004. And in 2003 nearly 10,000 people needed surgery to replace heart valves with artificial ones.